Im Gegensatz zu axialen Hiatushernien sind paraösophageale Hernien selten und können zu chronischer Eisenmangelanämie und schweren akuten Komplikationen führen. Die Versorgung ist vielfältig und einheitliche Standards fehlen. Ziel der Arbeit war es, unsere Erfahrungen an 286 Patienten mit paraösophagealen Hernien, die von 2003 bis 2014 im Klinikum Augsburg operiert wurden, insbesondere im Hinblick auf Morbidität, Letalität, Lebensqualität und Rezidivrate zu schildern. In 12 Jahren wurden insgesamt 286 paraösophageale Hernien operiert, davon 255 Eingriffe elektiv laparoskopisch und 31 offen als Notfalleingriffe. Die obligate hintere Hiatoplastik wurde bei 138 Patienten (48 %) mit einem leichtgewichtigen Kunststoffnetz verstärkt, welches in 90 Fällen mit Fibrinkleber fixiert wurde. Die intraabdominelle Fixierung des Magens bestand neben einer Gastropexie in einer ventralen (n = 244) oder dorsalen (n = 42) Fundoplikation. Komplikationen traten bei 8,4 % der Patienten auf. Die mittlere Liegedauer der Elektiveingriffe betrug 5,3 (± 2,8) Tage, die der Notfalleingriffe 24,7 (± 17,8) Tage. 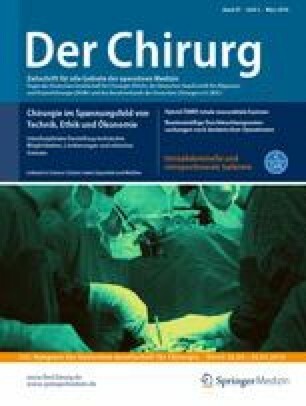 Der gastrointestinale Lebensqualitätsindex nach Eypasch stieg von präoperativ 92,8 (± 22,5) signifikant auf 109,6 (± 20,2) im postoperativen Verlauf an (p < 0,001). 20 Patienten (7 %) erlitten operationspflichtige Rezidive, davon 7 Früh- und 13 Spätrezidive. Während unmittelbar postoperativ radiologisch festgestellte Frührezidive umgehend revidiert wurden, richtete sich die Strategie der Spärtrezidive im Langzeitverlauf nach der Klinik: asymptomatische Hernien wurden konservativ, symptomatische Hernien operativ behandelt. Symptomatische Spätrezidive entwickelten 4,6 % unserer Patienten, wobei dies 7,4 % (11/148) der Patienten ohne und 1,4 % (2/138) mit primärer Netzversorgung betraf. An 286 Patienten konnte gezeigt werden, dass paraösophageale Hernien mit geringer Morbidität und Letalität versorgt werden können und das operative Ergebnis zu großer Patientenzufriedenheit führt. Netzimplantationen reduzierten die Rezidivrate. Die Erfassung der Lebensqualität ist ein gut geeigneter klinischer Verlaufsparameter bei der Beurteilung paraösophagealer Hernien. Ein Erratum zu diesem Beitrag ist unter http://dx.doi.org/10.1007/s00104-016-0207-0 zu finden. In contrast to axial hiatus hernias, paraesophageal hernias are rare but can lead to chronic iron deficiency anemia and severe acute complications. Treatment is manifold and consistent standards are lacking. The aim of this study was to describe our experiences of 286 patients with paraesophageal hernias, who underwent surgery from 2003 to 2014 at a tertiary referral center. The study was particularly concerned with morbidity, mortality, quality of life and recurrence rates. In 12 years a total of 286 paraesophageal hernias were surgically treated, 255 with a minimally invasive procedure and 31 with an open approach. In 138 patients (48 %) the suture-based hiatoplasty was reinforced by means of a lightweight mesh, which was fixed with fibrin glue in 90 cases. Abdominal fixation of the stomach consisted of a gastropexy and anterior (n = 244) or posterior (n = 42) fundoplication. Complications arose in 8.4 % of the patients. The mean hospital stay was 5.3 (± 2.8) days for elective surgery and 24.7 (± 17.8) days for emergency operations. The gastrointestinal quality of life index according to Eypasch significantly increased from mean preoperative values of 92.8 (± 22.5) to 109.6 (± 20.2) in the postoperative course (p < 0.001). Of the patients 20 (7 %) suffered a recurrence requiring surgery, including 7 early and 13 late recurrences. During the immediate postoperative period radiographically detected recurrences were promptly revised. The strategy of late recurrences in the long-term course was based on patient symptoms and asymptomatic hernias were treated conservatively while symptomatic hernias were surgically treated. Symptomatic late recurrences developed in 4.6 % of the patients, including 7.4 % (11 out of 148) without and 1.4 % (2 out of 138) with primary mesh repair. The repair of paraesophageal hernias in 286 patients provided excellent patient satisfaction and symptom improvement with low perioperative morbidity and mortality. Mesh reinforcement reduced the recurrence rate. The quality of life index is a suitable clinical course parameter for evaluation of paraesophageal hernias.